It was a sunny afternoon in early February, and Sihema Donald had her Mattapan apartment all to herself. Her two daughters, ages six years and four months, were off at church with their grandmother. After the whirlwind of the past few months, Donald, a single mother, was still struggling to catch her breath. "I thought I was on the verge of being homeless," explained Donald, a petite woman in a bright-pink tank top. "There was no way I wanted that." The difficulties had begun, it seemed, when Donald, age 24, discovered that the benefits package she had selected at her job at the Beth Israel Deaconess practice in Chestnut Hill did not include paid maternity leave. With her supervisor's support, she worked to save up as much comp time as she could, coming in early and staying late through the end of her pregnancy. Even with the extra hours, though, Donald was only able to cover one month of paid time off. Between a new baby and a kindergartner, she ended up staying out of work two months. And it was that second month, with two children to feed and no paycheck, that ultimately plunged Donald into a downward spiral. First, her landlord took her to court when she was two weeks late with the rent. Christmas was coming, and her eldest daughter, then five, kept handing her Christmas lists. But the final straw, Donald remembered, was the phone call from NStar threatening to shut off the lights. "I just thought I was going to go crazy," she said. It was only the kindness of strangers that saved her. A grant of $500 from Travelers Aid Family Services, a social services agency in Boston, kept her from being evicted. Then, a week or so later, a new venture called Small Can Be Big swooped in and paid off her remaining $2,227 in overdue bills. "That was a blessing that came out of nowhere," said Donald, breaking into a wide grin. Indeed, Small Can Be Big, which was launched on Jan. 14 by the Boathouse Group, a Waltham-based ad agency, had been on the scene for only a few days when it came to Donald's rescue. By the time its three-week anniversary had rolled around, the initiative had raised $15,000 and kept 10 similarly cash-strapped families from tumbling into homelessness. Its goal is to prevent 100 such families from becoming homeless by winter's end. Boathouse Group's president, John Connors III, son of Boston advertising giant Jack Connors, dreamed up the idea for Small Can Be Big last fall. Through a chance conversation with Judy Beckler, the executive director of Saint Mary's Women and Children's Center in Dorchester, he had learned about a family in Roxbury that was facing eviction. It was easy enough to pay off a few bills for them, he recalled. But the experience got him thinking about all the other families in the city who were teetering on the brink of homelessness. 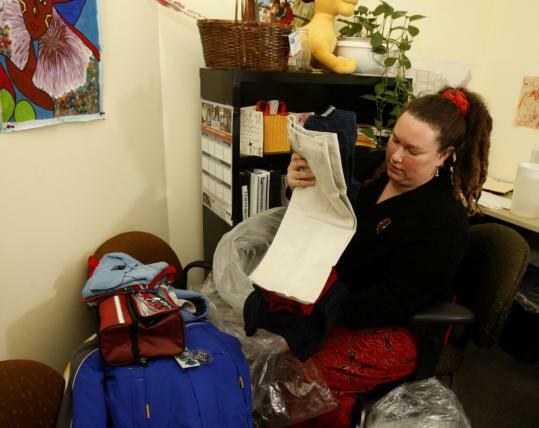 "It's an epidemic," confirmed Alison Bromley, a social worker at Travelers Aid, one of 10 social service agencies that have signed on with Small Can Be Big to help identify local families who are not chronically homeless, but who are nonetheless at risk of losing their home. "Imagine that your income just exactly matches your expenses every month," she continued. "One unexpected expense - an emergency room co-pay, for example - can throw you right off track." Small Can Be Big uses the Internet to (as it phrases its mission): "connect people with a little extra to families without enough." Vignettes describing individual families and the circumstances that have pushed each to the brink of homelessness are displayed on its website, together with the dollar amount needed to pull each family back from the edge. Anyone looking to help can target their gift to a particular family - and they can give immediately, with just a few clicks of the mouse. The amounts donated so far have been small, said Amanda Zarle, executive director of Small Can Be Big; typical gifts range from $1 to $100. But the whole point is that small sums add up quickly, she emphasized - especially when it's usually no more than a thousand or so dollars that's needed to get families back on safer ground. Such was the case for Sihema Donald. Yet, when Bromley from Travelers Aid told her to add up her bills, Donald's reaction was a skeptical "Sure, why not?" "I was stunned when it actually worked," she remembered. "A couple of months ago, I couldn't see it," Donald went on, growing quiet. Then she glanced over at a photo of her daughters, and smiled. "But now everything's falling into place."